"...The word gaucho could be described as a loose equivalent to the North American 'cowboy' (vaquero, in Spanish). 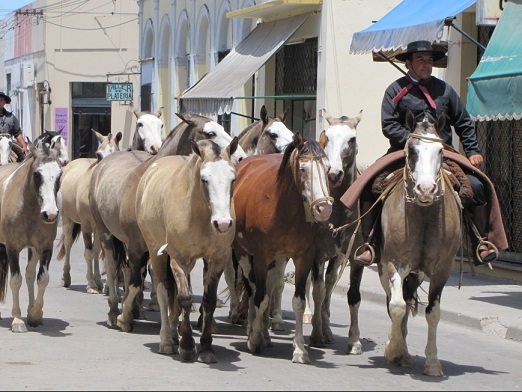 Like the North American word cowboy, Venezuelan or Colombian llanero, or Chilean huaso, or the Mexican charro, the term often connotes the 19th century more than the present day; then gauchos made up the majority of the rural population, herding cattle on the vast estancias, and practising hunting as their main economic activities. The word "gaucho" is sometimes used to refer to chimichurri, a steak sauce common to Argentina. There are several conflicting hypotheses concerning the origin of the term. It may derive from the Mapuche cauchu ('vagabond') or from the Quechua huachu ('orphan'), which gives also a different word in Spanish guacho. The first recorded uses of the term date from around the time of Argentine independence in 1816. Cattle were brought to the Pampas from Paraguay in 1580, by the colonial expedition of Juan de Garay. In the 18th century, the gauderios, who lived by hunting wild cattle, were recorded, most famously by the travel writer Alonso Carrió de la Vandera, when he passed through what is now northern Argentina. Commercial cattle ranching began in the second half of the 18th century. Gauchos were generally nomadic, and lived in the Pampas, the plain that extends north from Patagonia, bounded on the west by the Andes and extending on the east to Uruguay and the Brazilian state of Rio Grande do Sul. These nomadic riders lived by hunting wild cattle. Most gauchos were of mixed Spanish, Portuguese and Amerindian (native American) ancestry. There are also gauchos of largely African or part African ancestry as well. An inconclusive genetic study conducted by FAPESP (Fundação de Amparo à Pesquisa do Estado de São Paulo) in 2007 detected an Amerindian with a, perhaps, stronger Spanish than Portuguese admixture in Brazilian gaúchos. A small African admixture was also found. The area that is Rio Grande do Sul belonged to the Spanish Crown for over two centuries before it became a Portuguese possession in 1750 (Treaty of Madrid). The results of the study were not conclusive, and raised questions that will require further attention. The study clearly showed that their MtDNA has much stronger affinities with Amerindian MtDNA in Argentina and Uraguay than with Amerindian MtDNA from other parts of Brazil and suggests that this is probably due to genetic ancestry from the now extinct Pampean Indians (Charrúa, Minuano). Some gauchos were recorded as being in the Falkland Islands, and have left a few Spanish words in the local dialect e.g. camp from campo. The gaucho plays an important symbolic role in the nationalist feelings of this region, especially that of Argentina, Paraguay, and Uruguay. 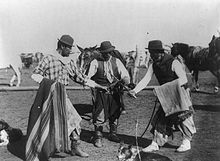 The epic poem Martín Fierro by José Hernández (considered by some the national epic of Argentina) used the gaucho as a symbol against corruption and of Argentine national tradition, pitted against Europeanising tendencies. Martín Fierro, the hero of the poem, is drafted into the Argentine military for a border war, deserts, and becomes an outlaw and fugitive. The image of the free gaucho is often contrasted to the slaves who worked the northern Brazilian lands. Further literary descriptions are found in Ricardo Güiraldes' Don Segundo Sombra. 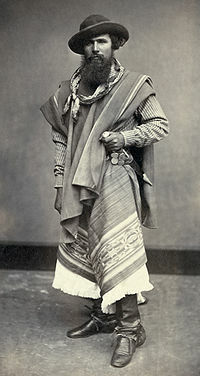 Like the North American cowboys, as discussed in Richard W. Slatta, Cowboys of the Americas, gauchos were generally reputed to be strong, honest, silent types, but proud and capable of violence when provoked. The gaucho tendency to violence over petty matters is also recognized as a typical trait. 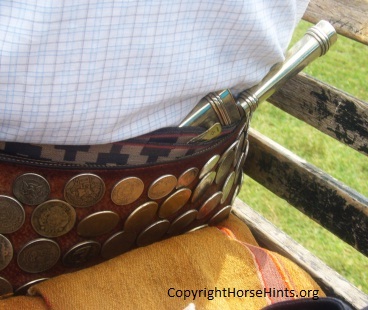 Gauchos' use of the famous 'facón' (large knife generally tucked into the rear of the gaucho sash) is legendary, often associated with considerable bloodletting. 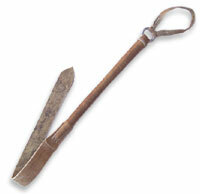 Historically, the facón was typically the only eating instrument that a gaucho carried. We took this picture on our Argentina trip while at the Estancia (ranch) Santa Susana It was worn by one of the gauchos helping with the horses. Also like the cowboy, as shown in Richard W. Slatta, Cowboys of the Americas, gauchos were and remain proud and great horseriders. Typically, a gaucho's horse constituted most of what he owned in the world. During the wars of the 19th century in the Southern Cone, the cavalries on all sides were composed almost entirely of gauchos. In Argentina, gaucho armies such as that of Martín Miguel de Güemes, slowed Spanish advances. Furthermore, many caudillos relied on gaucho armies to control the Argentine provinces. The gaucho diet was composed almost entirely of beef while on the range, supplemented by yerba mate, an herbal te-like drink rich in caffeine and nutrients. Argentine cooking draws influence from the simple but delicious recipes used in gaucho meals. Gauchos dressed quite distinctly from North American cowboys, and used bolas or boleadoras - in Portuguese boleadeiras- (three leather bound rocks tied together with approximately three feet long leather straps) in addition to the familiar 'North American' lariat or riata. 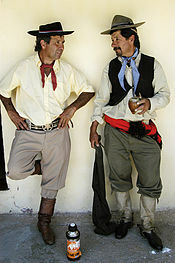 The typical gaucho outfit would include a poncho (which doubled as a saddle blanket and as sleeping gear), a facón (large knife), a rebenque (leather whip), and loose-fitting trousers called bombachas, belted with a tirador, or a chiripá, a piece of cloth used in the fashion-but not the function-of a diaper. In the wintertime, gauchos wore heavy wool ponchos to protect against cold. Nowadays, working gauchos are as likely to be found in overalls and wellington boots as in their traditional dress. While on our trip to Argentina we visited a wonderful tack shop called Talabarteria Criolla. They are a high quality shop that does custom work such as riding boots, as well. If you are able to visit that shop it is well worth your time. When you enter the smell of leather fills your lungs and you know that you have arrived. Just around the corner there is also an amazing carriage shop that is a must see--it is part of the tack shop but in a seperate location. The picture below was provided by Agustina who was wonderfully helpful. She presently works at Talabarteria Criolla Arandu and is also a vet. Agustina has given permission to use the picture below on HorseHints.org. While at the ranch in Argentina we learned from the gauchos that in order to train the young horses they use the alpha mare also referred to as the Godmother. The young horses follow her around and mimic what she does. The mare, already having been trained, saves the gauchos lots of time and effort in the training of the younger horses. 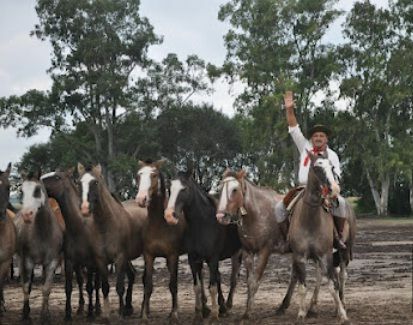 In the picture you will find a gaucho with his "TROPILLA" (group) of horses, all of young horses follow a female horse who wears a bell around her neck. The Alpha mare is called the Godmother. Godmother (Alpha Mare) left of the Gaucho. Jayendra photographed this at the Estancia Santa Susana. He has given us permission to use his photo. Look closely and you can see the bell around the neck of the Godmother. The gauchos were demonstrating how they trained the young horses using the Alpha Mare. Photographed by myself (Binksternet) at Estancia La Cinacina in San Antonio de Areco, Argentina, April 2006. 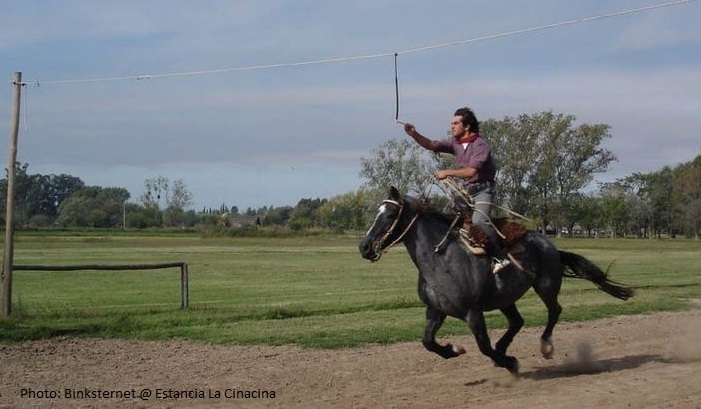 Modern-day recreation of the Argentine gaucho contest Carrera de sortija involving the spearing of a ring (argolla) on a pencil-sized wooden lance by a rider on galloping horseback.